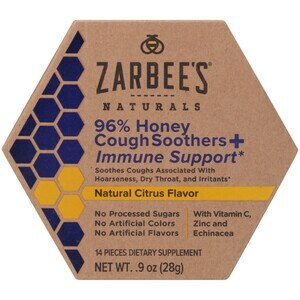 Zarbees Naturals 96% Honey Cough Soother & Immune Support* is a simple and effective way to soothe coughs associated with hoarseness, dry throat, and irritants. With vitamin C, zinc, and Echinacea for immune support,* this wholesome cough soother features a special blend of honey and natural flavors. Created by a pediatrician and father looking for a healthy and chemical-free alternative for his family, Zarbees Naturals 96% Honey Cough Soother & Immune Support* is made with carefully sourced, wholesome ingredients, with no artificial flavors or colors and no processed sugars. This citrus-flavored soother is for adults and children 5 years and older. Suggestions for Use: Adults and children 5 years of age and over: dissolve one piece slowly in mouth and repeat every 1-2 hours, or as needed. KEEP OUT OF REACH OF CHILDREN. CHOKING HAZARD. Consumption should be avoided by infants and any individuals with a known allergy to the listed ingredients. Do not use if blister package is damaged.